Seamark Asset Management president Don Wishart, CFA, CMA, CPA, is executive in residence for the University of New Brunswick’s Centre for Financial Studies (CFS). 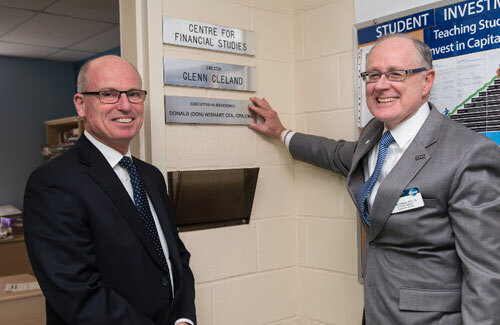 In this volunteer role, Mr. Wishart will provide regular mentoring throughout the year to the students enrolled in the Student Investment Fund (SIF) course, as well as to the Director of the CFS, Glenn Cleland. Seamark Asset Management, a Halifax based investment firm with a New Brunswick office, has been associated with UNB’s CFS since 2008, when its CEO Bob McKim served as part-time executive in residence. Mr. Wishart was a part-time executive in residence in 2010. In 2011, UNB’s CFS partnered with Seamark to manage $2.5 million of UNB endowment funds, which expanded the investable universe for the SIF program. The SIF was the first program in the Atlantic region that allowed students to invest in the capital markets and is the flagship program of the CFS. The program was formed in 1998 when the New Brunswick Investment Management Corporation (NBIMC) provided the students $1 million of its pension asset fund to manage. The Seamark partnership combined with the NBIMC partnership has brought the assets under management for SIF students to almost $8 million as of Dec. 31, 2015. Seamark has had a 15.5 per cent return since the inception of the partnership with UNB’s endowment, outperforming their benchmark by a staggering 420 basis points, first quartile performance. In his role as executive in residence, Mr. Wishart will meet with students in the SIF class to provide feedback on their investment analysis and decisions, insight into the investment industry and advice on their professional development and career choices. Seamark Asset Management has provided investment management services for over 30 years with a focus on preserving and enhancing clients' assets over the long-term. Since its inception in 1982, experienced and accessible investment professionals have followed a team-based process that consistently applies clearly articulated investment principles to meet each client’s objectives. For further information please contact Glenn Cleland, CFA MBA CAIA ERP – Cleland@unb.ca, 506-458-7510.